See below for different types of steel building sizes. Steel buildings are the superman of industrial real estate. They’re strong enough to endure harsh weather, durable enough to last a long time and capable of fitting into almost any budget. It all depends on the size you want. Steel building sizes are also variable enough to fit a multitude of needs. They can get used as a place to hold a church meeting, store valuable industrial tools, keep your farm equipment out of the weather. Why Check Out Steel Building Sizes? 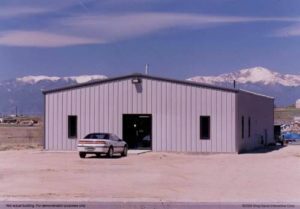 There are many reasons why manufacturers, contractors, and even small groups need steel buildings. One of their greatest features is that they can expand later, if necessary. For example, you may rent or purchase a 2,000 square foot building, but then decide to add on 8,000 more square feet later. If you’re looking for a customizable option, this is one worth considering. The manufacturer works with you to build a custom creation when you share your plans and budget with them. What exactly are steel buildings? The phrase “steel building” might imply a heavy structure that doesn’t move easily. But, the interior support structure is where the steel gets installed. Then it’s covered with whatever type of exterior you prefer. The durability of the building is what creates the strength, so it remains standing in different environments. The contractors may cover the exterior in steel sheets, but these aren’t the same form as the internal supports. They also don’t carry the same heavy, concentrated weight. How are Steel Buildings Made? Contractors construct steel buildings using several types of fabrication. These are conventional steel fabrication, light gauge steel construction and bolted steel construction. The first type of construction involves taking an exact measurement of the steel pieces. The steel pieces get cut according to each one’s specific use. Then, the pieces get shipped to the job site and welded together to complete the building. One benefit of this method is that workers can cut the steel pieces on site if that is more convenient. Light gauge construction is when contractors replace regular 2×4 wood pieces with pieces of steel. Each steel piece gets bent and formed according to where it will go in the house’s internal support structure. Finally, the bolted steel construction method involves experts. They produce, finish and paint each steel piece before it arrives on the construction site. In this method, the paint really makes a difference as a protection against potential future corrosion. A trucker transports these pieces to the site where workers bolt them together for the completion stage of the job. You can discuss each of these methods in more detail when you’re obtaining information from the manufacturer about a potential order. It would be more difficult to find a reason why steel buildings aren’t an excellent choice than to name a purpose where they would be unhelpful. Do you need a barn or structure to store your industrial farm equipment out of the weather? Do you need a workshop that can endure the wide range of temperature changes? Do you need a meeting place for your church or school? Would you like to set up a temporary structure that serves as storage or a working warehouse? What about using it as the foundation for a place to live? Structures like this work well for one-story residential structures or high-rises in the middle of downtown. All these uses are perfectly suited to a steel structure because of the strength and durability that the material itself offers. This steel structure will outlast its own depreciation and continue to offer value to the buyer. Depending on the construction method, steel structures can get manufactured and constructed quickly. But, that doesn’t reduce the life expectancy of any of them. They are flexible in nature, which means they withstand wind and other environmental factors quite well. They are susceptible to the hot temperatures of fire and to corrosion, but there are ways to prevent both from occurring. With the proper preventative care and maintenance, there is no reason why your steel building should not last as long as you need it to. Of course, if you make modifications to the size, then that adds to its value, but it doesn’t change the expected life of the original structure. As mentioned above, this is especially true with the bolted steel construction method. Every piece receives a coat of paint before it’s connected to the others. The paint reduces to the chances of corrosion and should be maintained over the years to continue that protection. No matter what construction question you’re asking, it’s a good bet that steel buildings can provide a solution. They come in a variety of sizes that work well for many needs. It can be anything from an individual shed to a ranching business to a large meeting site and residential buildings. They provide durability and flexibility in earthquake-prone zones. Manufacturers also customize them for both individual and corporate needs. The buyer gets their money’s worth with every purchase because the structure lasts for so long. It adds value to the property where it’s placed, which is a benefit to the owner on a long-term basis. They set up quickly, which means they work as well on both short-term and long-term projects. In conclusion, the only way to get the most from your property is to develop it out with buildings that are useful. Compare the cost of different steel building sizes. Then, decide what works best for your individual or company needs. Once you’re ready to buy, contact the representatives at Steel Building Zone. Let us know why you’re considering purchasing a steel building and we’ll help you with specific recommendations. Our experience in matching up the right sizes of the structure with customer needs helps us answer any questions you may have during that consultation. Contact us today and see what’s out there!